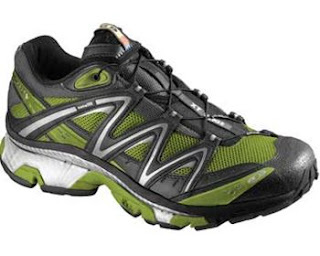 These are marketed as effortless running shoes that are suitable for any terrain, and from the first step in these they felt comfortable, well fitted and almost worn-in already. I found they gripped and glided over whatever the surface I ran on including a mixture of roads and trails, and felt equally comfortable to road running as to trails.. The Triple Density Eva mid-sole gave such a good ride and great lacing system that only requires one pull to adjust and then leave, made these a perfect pair for shoes. The loud “grass and black”, the restrained (?) bright red or the more subtle black and grey, give you the option of really standing out or blending in with the crowd, but with the speed agility and grip that these shoes give, most other runners will be left looking at your dust trail. One last point; they do fit snugly, so I would recommend a ½ size bigger than normal, but they still feel great. On a rating of 1 to 10, I would have to give these 10, as I cannot fault them at all.